Less stimulus is expected from export business, with less growth from emerging countries (especially China) and the impact of Ukrainian conflict and the European sanctions against Russia. However, in construction the business climate index rose slightly, so the construction companies were slightly more satisfied with their current situation than in July. In addition, they are slightly more optimistic regarding the business outlook. In addition, in the 2Q of 2014, the number of persons in employment whose place of employment was in Germany amounted to roughly 42.5 million, the highest figure in its history according to provisional calculations of the Federal Statistical Office (Destatis). The number of persons in employment increased by 340,000, or 0.8%, from the second quarter of 2013. Thus, these figures show that the German labor market keep sound and domestic demand could still come to boost German economic growth. Meanwhile, European stock markets are rising, euro zone bond yields fall and the euro has fallen to a near one-year low against the dollar. It seems that Draghi’s words have hit the nail on the head, again. 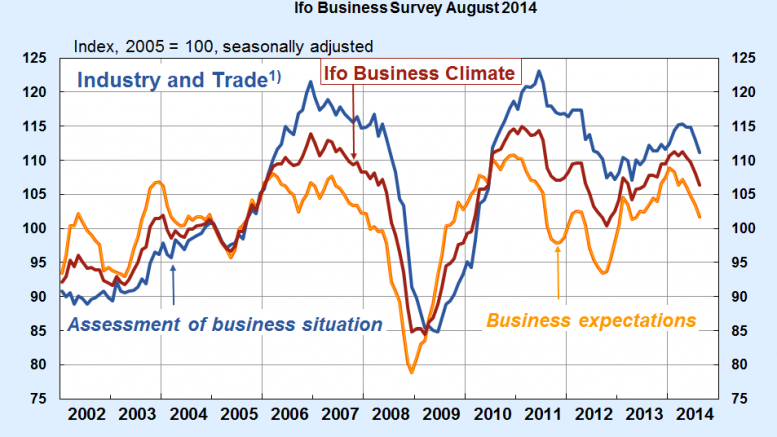 Be the first to comment on "Germany’s business climate continues to worsen, but labor market keeps its strength"